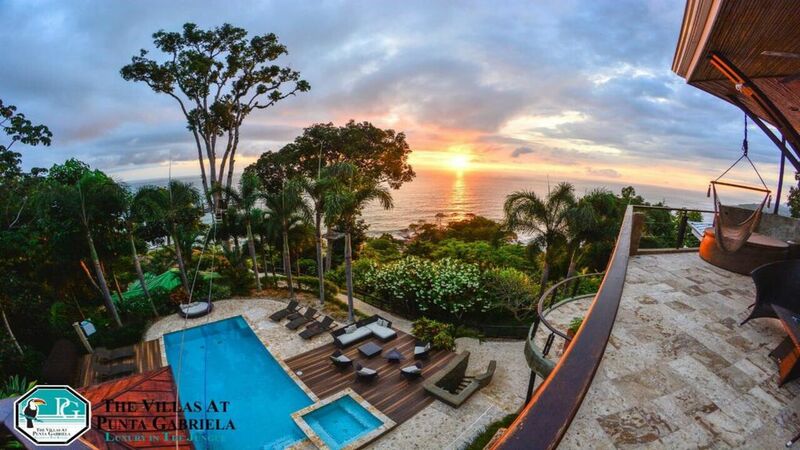 Looking for a Luxury Vacation Villa in Costa Rica? Look no further than The Villas at Punta Gabriela. This 7500 sq ft property is for the affluent vacationer who enjoys the better things in life. No other resort boasts the level of Privacy, Scenery and Comfort. Nestled snugly along the coastal rainforest of Dominical in the South Pacific of Costa Rica. Surrounded by the lush jungle and 180 degree views of the Pacific. Features: 4 luxurious suites, the main house and 'Social area'. Three of the Villas are detached from the Main House and the 'Social area', while Villa 4 (The Penthouse) is located on the third floor of the Main House. All of the Villas offer the same deluxe experience, each with an area of 550 sq ft, kitchenette and private bathroom. Villa # 1 also has its own private pool and Jacuzzi and long deck overlooking the Pacific Ocean. Villas #2 and #3 have great views of both the Pacific Ocean and the surrounding gardens. Villa #4 (The Penthouse) sits on the third floor with three tall glass doors that open to the incredibly beautiful sea. The balcony has an outdoor shower and hot tub. A gourmet kitchen, which you can use to cook for your party, or reserve our on site Chef to cook all your meals. A bar with TV and stereo ceiling fans keep you cool while looking at the beautiful pool and gorgeous Pacific Ocean. A large pool and jacuzzi with shaded seating in the gazebo, and an open deck area to soak up the sun. A BBQ area in the perfect location near the pool deck, which creates a comfortable atmosphere for socializing and cooking with family and friends. Beautiful gardens throughout the property containing the most exotic plants native to Costa Rica. A one-of-a-kind tree platform that overlooks the Pacific Ocean and connects to our private zip line. A Heli-Pad located above the Penthouse, which allows guests to be picked-up on-site for guided tours of the surrounding rainforest and coastline. Once you arrive at Punta Gabriela, you will enjoy 'luxury in the jungle'. Ideal for Families up to 8 or 4 couples. Book per week. Karen and I fell in love with Costa Rica on our first trip together in 2003 we found this unique property and it captured our souls. That is when we decided to build our future retirement location and share it with others where we know it will capture your souls as well. Neither words nor pictures can describe the beauty of Punta Gabriela. It must be visited to fully appreciate the sights and sounds. The views from each room and anywhere on the property are incomparable. Each day is a different experience because of the peaceful sounds and breath-taking views that the property offers all day and night. It is a true paradise.